Are you someone who has always had difficulty managing your house or certain chores in your house? Are you someone who has difficulty knowing what papers to keep? If so, we can help you. 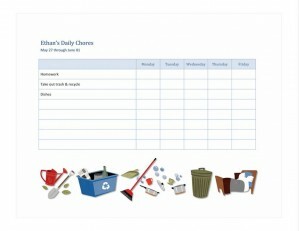 You can download this free, customizable and easy-to-use household chores checklist template right here on our website. The point of doing household chores in the first place is to maintain your own health and safety. Especially if you’re someone who tends to have difficulty with organization in general, it is very advisable to keep track of your chores with a Household Chores Checklist. It doesn’t matter if you use a piece of paper that you can keep at the same place all the time or if you use a dry erase board, a Household Chores Checklist just might be the key to preventing insect and rodent infestation and more importantly, prevent you from contracting a preventable disease and ending up in the hospital. Look around your home and make note of the chores that need to be done. Then type those chores into the template. Be sure to make however many you need. The template is customized so that you can arrange your Household Chores Checklist on a daily, weekly, monthly or even seasonal basis, whatever is most convenient for you. Though please be consistent with whatever you choose. If there’s any particular project that’s intimidating for you to do, please don’t hesitate to break it down into small steps. You can do so by making a separate list with that particular chore as the subject and the cleaning or organization steps that need to be done with it. You can arrange your Household Chores Checklist in the way you find most helpful for you. Are you more comfortable with arranging your Household Chores Checklist by number and specific steps or simply listing them by category and name? Making lists can be a pain and an inconvenience. Using our Household Chores Checklist template makes the process easier and smoother.